With a nickname like his you'd assume Greg Norman would be pretty adept in the water and the golf legend showed off his fine fishing skills when he came face-to-face with the ocean's meanest beast. 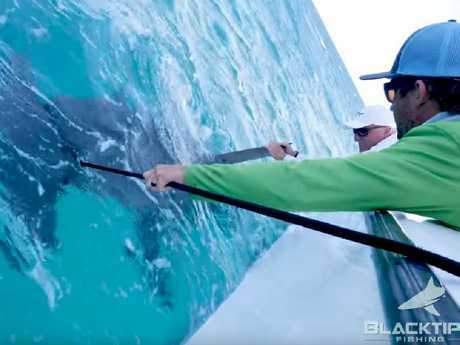 Featuring on an episode of online fishing show BlacktipH with host Joshua Jorgensen in Florida, the pair got the thrill of a lifetime when they had two sharks on camera. One had two legs, two arms and stood about 1.83m tall. The other had fins, gills, teeth that can tear flesh apart and was about 4.5m long. And didn't they love it. Norman had originally hooked a blacktip shark but got an unexpected surprise when out of nowhere, a giant hammerhead appeared and started stalking it. 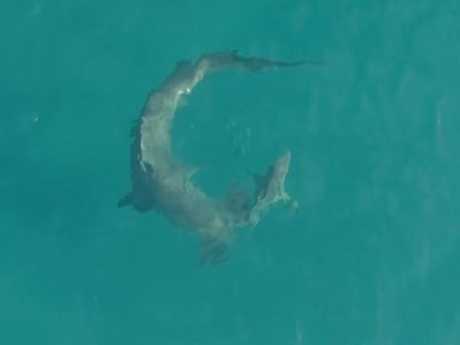 The hammerhead kept hunting until it latched onto the much smaller blacktip - estimated to weigh about 45kg - before eventually swallowing it. 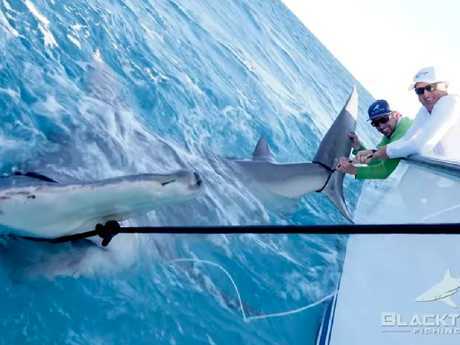 "We hooked a blacktip and all of a sudden this giant hammerhead came flying in on the blacktip," Norman said. "It was the most incredible scene I've ever witnessed." As Norman and Co. prepared for the battle ahead by reeling in the huge fish, the golf great was heard on the phone describing it as probably tipping the scales at 1300 pounds - nearly 600kg. The blacktip shark never stood a chance. The 64-year-old strapped into a fishing harness as he started what loomed as a potential two-hour ordeal. Or as he and Jorgensen called it, "the fight of the year". As the mammoth shark started to swim away from the 12.5m boat, it actually had enough power to tow the vessel - which Norman suggested weighed over 10,000kg. That's how strong the hammerhead was. "When you start thinking about the poundage that this fish is pulling around, not just the boat but the people on the boat and the fuel on the boat, that is an impressive statement about the energy and the power of these magnificent animals," Norman said. For good measure, Jorgensen added: "It's insane. These fish are so powerful, it's unbelievable." The duel continued until the boat caught up to the tiring shark, which was within metres of the boat. That's when the enormity of what was unfolding really hit home. "When you see that fish for the first time up against my 41-foot boat you go, 'Holy moly, this thing's huge. It's bigger than I ever anticipated'," Norman said. Seeing the hammerhead up close was spine-tingling. 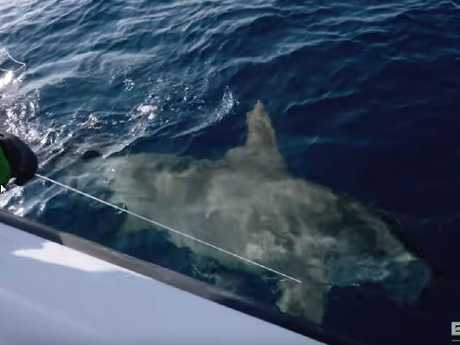 Jorgensen squealed with excitement as the crew tried to keep the shark in place, tying rope around its head and tail for long enough to grab some photos. They then spent about 40 minutes reviving the hammerhead, getting water into its gills. Next, for reasons that can only be explained as Greg Norman going full Greg Norman, The Shark got his shirt off, jumped into the water to join his namesake and convinced everyone else to get wet with him - while the hammerhead was still there. "Why? Because we wanted to feel connected to this fish. We wanted this fish to feel like, 'OK, these guys are really trying to revive and get me going'," Norman said. The crew measured the hammerhead with rope and claim it was 4.44m long - 10cm longer than the official world record for the largest hammerhead ever caught. But because Norman and his sidekicks released the shark, their record won't be recognised. We're guessing the only thing on Norman's boat bigger than that hammerhead - which he later put at over 540kg - was the golfer's ego after he reeled in the memorable catch. 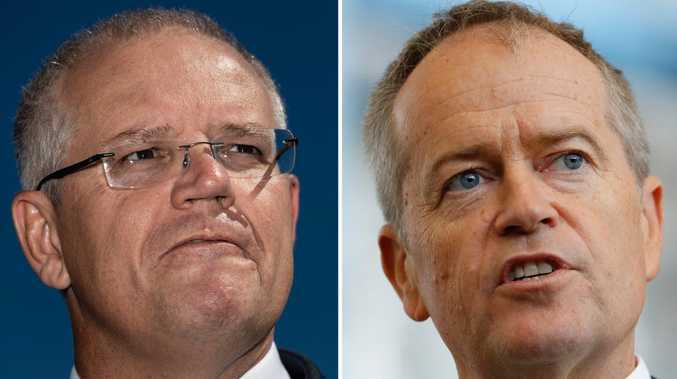 Norman and Co. finally hit their target.